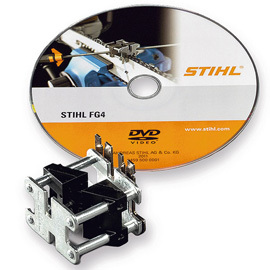 Exclusive STIHL file holder guide. Compact roller filing tool for precise filing with minimum effort. Ideal for professionals who sharpen on a weekly basis. With integrated file tip for adjusting the depth gauge setting after sharpening. Helpful tips are included on a DVD. File not included. FG 4 roller filing tool 3/8"
FG 4 roller filing tool .325"